This night, BE YOUR OWN QUEEN. Jenny Chou started it’s journey from 2008, 10 years is one of our achievement. Our hand tailored dresses have become new trend in these 10 years. This time we would like to take this opportunity to celebrate our anniversary. 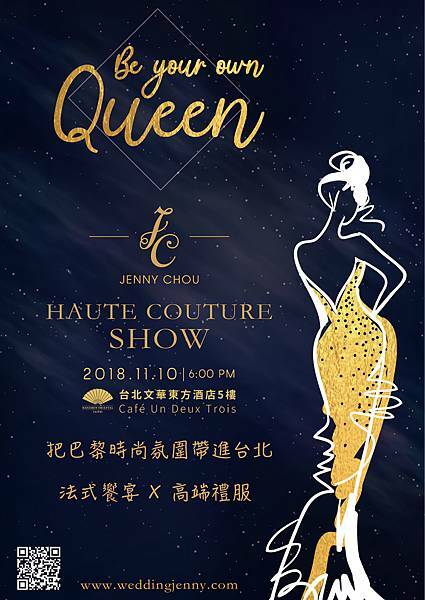 Jenny Chou dress fashion show will be held at Mandarin Oriental Taipei on 10th November 2018. Jenny invites you to this French fashion show with Cafe Un Deux Trois restaurant. All of elegant dresses will pair with classic French cuisine delicately. This date, you will be your own queen. Price: NT$ 3,800, Early bird price is NT$ 3,500 before 20th September, 2018. Dinner includes French classic four courses menu, Wine and Champagne. 2019 new collection of Jenny Chou Gown will soon to reveal in our event. Let’s experience this luxury event in Taipei.